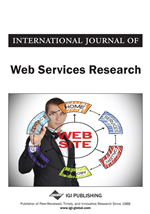 Research on Web services aims at extending the Web with computer-understandable descriptions enabling programs to interact and exploit Web-accessible programs without human intervention. Advances in this line of research will strongly benefit the fields of intelligent and mobile agents due to their potentials for building Web-enabled applications. In this paper, we describe a novel programming language called MoviLog for developing intelligent mobile agents that interact with Web services. The most interesting aspect of the language is its Reactive Mobility by Failure mechanism that allows programmers to develop mobile agents without explicitly providing code for handling mobility.